PNW embroidery kit ($24) — you can make Washington, Idaho Oregon or Montana. Inspiration abounds in Spokane's Art Salvage shop. The storefront on North Ash offers artists and crafters all sorts of materials that can be repurposed into creative projects. Founder Katie Patterson Larson says the nonprofit's goal is twofold: "To keep reusable materials out of the landfill, and to keep them local. It's sustainable for the city, but also it is good for people to have access to them." Poking around in the store is almost as much fun as creating a finished project — there's an irresistible bin of buttons sold by the scoop, a tantalizing shelf of weathered glass jars of various shapes and sizes, neatly shelved vintage postcards and yellowed sheet music, as well as dozens and dozens of frames of all sizes, stacks of colorful paper and a cubby-hole shelf unit filled with colorful skeins of yarn. While the store is unique in Spokane, "There are creative reuse stores like this all over the world," says Patterson Larson, who has a background in art therapy and counseling. Volunteers help to sort and organize materials — all donated — ranging from leftover craft supplies, to fabrics and textiles, wood and leather scraps, interior design samples and "some pretty oddball random items," Patterson Larson says. Volunteers also put together various kits to help spur creativity. 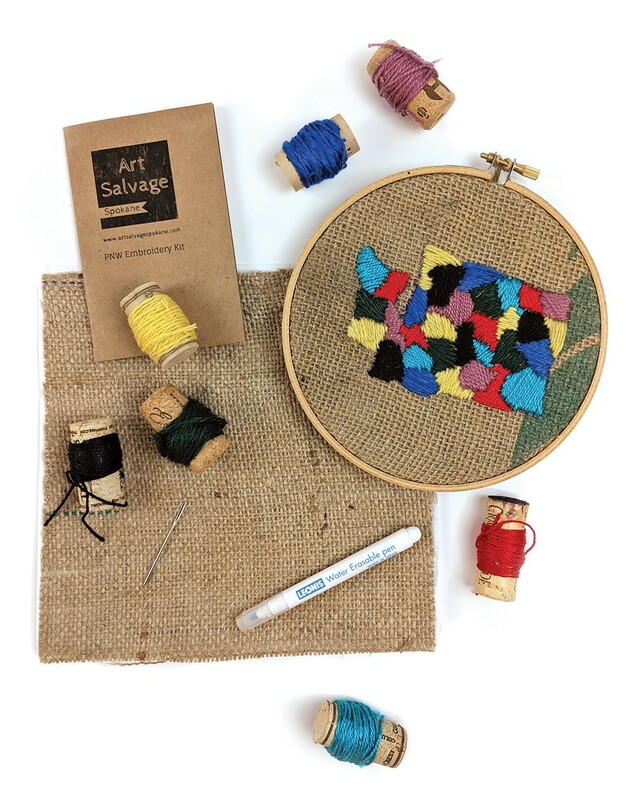 Collage kits and notebook kits are popular, and the needlepoint state kit is a big hit with kids. Patterson Larson says the store can always use volunteers to sort donations and help with maintenance. Donations are tax deductible and are accepted on Fridays from 10 am to 3 pm. Consult the website for guidelines on how and what to donate and check out the organization's wish list, too.